Yes it's still Breast Cancer Awareness Month my beauties, so let's keep it going with some more beauty products focused on the cause. AfterGlow Cosmetics has created a new lip cream color "Muse" which will help breast cancer research. 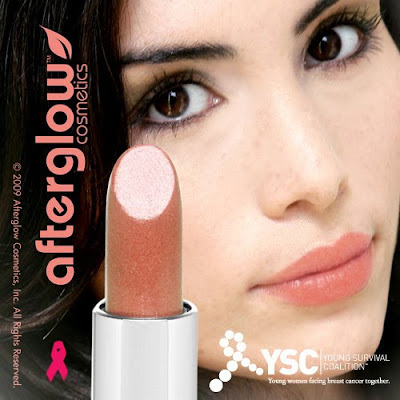 Through a partnership with the Young Survival Coalition (YSC), Afterglow has pledged to donate $2 of every purchase of Muse to help support women under 40 diagnosed with breast cancer. The lipstick actually comes in 19 different colors. It's a matte lipstick, with 100% organic ingredients, with enough moisturize to pack enough punch so no lip gloss is needed. All the lipsticks sell for $24. By purchasing an Organic Lip Love Lipstick in Muse you can be an inspiration as well and provide hope to more than 250,000 women who have been diagnosed with breast cancer under the age of 40, along with the 10,000 who will be diagnosed in the coming year. NEW organic mineral blush ($23) Blends great, perfect with the MUSE lip matte, comes in 8 luminess shades. The Glow Started and Traveler Kit ($68) valued at $120!